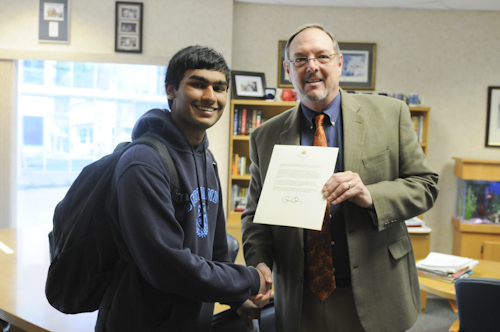 On Wednesday, Rohan Chandra, grade 12, was presented with an award for being a distinguished finalist by The Prudential Spirit of Community Awards, which annually recognizes and honors young people nationwide who have volunteered to help their communities. Chandra created earthquake preparedness kits for the senior citizens of his Fremont neighborhood, creating safety guides in a variety of languages, including English, Spanish, Farsi, Hindi and Mandarin. “We live in one of the most ethnically diverse areas of the world, so I wanted to do something to cater to different cultures,” Chandra said. With the help of dozens of volunteers, Chandra raised more than $12,000 to make the project possible. The award came with a letter from the office of President Barack Obama, thanking Chandra for his efforts and congratulating him on being recognized. He will also receive an engraved bronze medallion in the near future. Chandra expressed thanks to his family, friends and the Harker community, particularly Kerry Enzensperger, director of upper school community service, who assisted him in discovering this unique opportunity.